Summary of today’s show: A new spirit of evangelization is moving across the Archdiocese of Boston and one reason for it is the Why Catholic program offered by the Office of Worship and Spiritual Life. In a series of six-week sessions spanning four years, small parish-based groups explore the Church’s teachings through prayer and Scripture and apply them to their lives. Scot Landry and Fr. 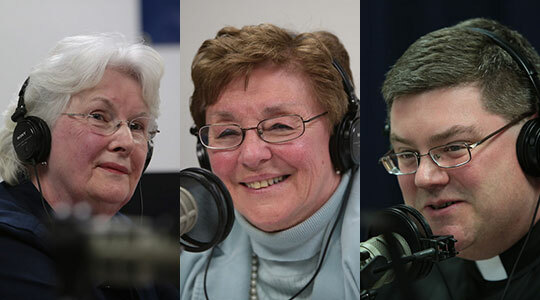 Chris O’Connor talk to Mary Ann McLaughlin and Janet Benestad about the genesis of Why Catholic in Cardinal Seán’s vision for evangelization and how it grew out of the success of the similar Arise program. 1st segment: Scot welcomed everyone to the show and noted that it’s the last week before Holy Week. Fr. Chris said he had a big surprise birthday party with family and friends last Saturday. Scot was able to attend. Fr. Chris’ family and friends ribbed him about how he sounds on the radio. They also ribbed him about the facts he got wrong, including he was born in East Milton, not Dorchester. The seminarians are preparing for Holy Week. This Saturday they will be having a work day in the seminary, cleaning up. A handful will also be going to help the Missionaries of Charity prepare for Holy Week as well. The seminarians are also continuing with the Stations of the Cross and having a penance service this Thursday. The deacons will be practicing the Exulset, the Easter proclamation. Scot noted that both the text and music are changed this year. Fr. Chris said his vocation was fostered in experiencing Holy Thursday, Good Friday, and the Easter Vigil and seeing the story of Christ’s love played out for us. The churches should be filled to the rafters. Scot said the Holy Father has asked us all to celebrate a Year of Faith starting in October, especially asking families to study the Catechism. Today we’ll discuss the Why Catholic? program, which encompasses four years of study of the Catechism. 2nd segment: Scot asked Mary Ann McLaughlin about Why Catholic? She said the Office of Spiritual Development always had a focus on small groups to build up larger groups. She said when Cardinal Sean arrived in 2004, he almost immediately called in the Office and told them of his desire to bring Renew International to Boston. He was clear that we needed somebody who could provide materials in various languages. They brought in the Arise program, which was a three year program. Scot said the parishes that enrolled in Arise reported tremendous results both in numbers of participants and in what it was doing for the parishes. Mary Ann said every one had been scared about whether the program was going to work, given everything that had been going on in the archdiocese. Scot asked Janet Benestad to compare the implementation of a program like this in a big archdiocese with a small diocese, like the Scranton diocese she came from three years ago. When she arrived in Boston, Arise was already running and there was 10,000 people enrolled. Cardinal Sean had been prophetic in the desire for a program that helps people reflect on Scripture and share what was in their hearts. Fr. Chris told the story of someone who was drawn back in to practicing her faith through Arise programs. Scot asked Mary Ann about her sense of people who were reconnected to the Church through Arise. She said she heard that one of the Daughters of St. Paul was approached by a woman who had left the Church, but saw a sign for Arise and came back to check it out. Scot said Arise and Why Catholic? are both small groups that share their faith. Mary Ann said Why Catholic takes the teachings of the Church and aligning them with Scripture, giving people an opportunity to digest it all. Janet said many people who’d met in Arise groups wanted to continue their study and reflection in small groups and so they came up with the Why Catholic program. Mary Ann said the wonder of both Arise and Why Catholic, after your pray Scripture and read the Catechism, you leave the meeting with the desire to implement these beliefs in your life. Fr. Chris asked how many people are involved in Why Catholic, but Mary Ann said we won’t know for sure until the end of Lent. She said they have a rough estimate of between 7,000 and 10,000. Mary Ann said this program has been done in other dioceses here and in other countries. She talked to other dioceses and had heard of so much success elsewhere. She’s hearing from participants here that they like it even more than Arise. Scot noted that the Catechism often collects dust on many bookshelves, but a program like this helps to break it open for people. The Catechism has four sections and this is why Why Catholic is over four years. The sections are Prayer, the Creed, Sacraments, and Christian life. Each session starts with a section of the Catechism, a passage of Scripture, and then application of the teaching to our lives. Scot asked Mary Ann how often she encounters people who have never been taught to pray. She finds that people you least expect are grateful for any help in learning how to pray. However much accomplished we seem to be in the life of prayer, there are always new benefits to receive, new depths to lump. It has made a huge difference for people. Fr. Chris asked for an explanation of how knowing the Catechism can help the faith life. Mary Ann said knowing the Catechism is layer upon layer. You hear what the Church teaches, hear it again in Scripture, and then in faith sharing you hear people tell you what it’s like to experience it in their daily life. Finally, you decide how you will implement what you have heard over the next week. Mary Ann said the group gatherings are 90 minutes. They begin with an opening prayer, then a reflection, a question, Scripture, one or two questions to allow people to respond again, and then suggestions for how they can use what’s there over the following week. She said the books have imprimaturs and nihil obstat so people can trust what they’re reading. Mary Ann also told stories of Arise groups going as a group to other events like The LIght Is On For You for confession or other programs. Mary Ann said the cardinal had hoped that Renew and Arise would lead people to Cursillo, to allow people to deepen their lives in a new way. Scot noted that Cardinal Sean lived a Cursillo in the first year of his priesthood and speaks often of the transformative effects. How do I consciously walk in God’s presence? In what instances of my life have gone away to lonely place to prayer? How do I feel when I offer prayers of blessing to God? How and when have I learned to pray? Who are some saints who I pray to because of my spirituality and how have they helped me? How have we as a small group grown comfortable with vocal prayer? Fr. Chris said these small groups are helping parishioners to learn the faith stories and life stories of fellow parishioners they only knew to say hello to before. A program like this allows for a type of sharing and connection that we shows we are one body in Christ. Mary Ann said they have book after book of testimonies from people in Arise. Parents tell of going home and telling their children about their experiences and opening up a faith-based dialogue with them. She said the language groups have been remarkable. The Vietnamese came to the English training and then set up Vietnamese training on their own, She also heard that at Mass people were suddenly hearing Scripture and were moved by it. Mary Ann said many aspects are wide open. Groups can meet at church or in their homes, on any day of the week and any time of day. The flexibility allows them to meet the local needs. Some people prefer going to the church and others prefer going to their neighbor’s house. 3rd segment: Scot asked Mary Ann about the training resources available for those interested in starting a group in their parish. First, Mary Ann suggested they call her office at 617-779-3640. She said Renew International offers webinars for parishes who come into the program too late for the regular training. One leader gives distance training for up to 25 people at their computers. Training sessions take place regionally prior to each six week session. The Lent session is coming to an end and in October is when the next session starts. Mary Ann said the program is parish-based so parishioners would need to go through their pastors. The spiritual life happens within communities and Renew has always worked first through the bishop and then through the priests in the parish. As pastors begin to serve more than one parish, Renew sees the opportunity to bridge across parish lines in these small groups. They do have individuals calling asking them how to join a group. They encourage them to talk to their own pastor or to pair up with a neighboring parish. Scot said he believes for the parishes that haven’t done this, it’s because there haven’t been enough people to step forward to take the initiative with their pastors. Janet said these programs foster lay leadership in parishes. She encourages interested people to talk to the pastor and offer themselves to go to the training and do the work to bring it to the parish. Mary Ann said in the fall they will have a faith enrichment festival to allow all the parishes to come together for a prayer experience. She said she hesitates to give expectations, because you never know where things will go. Her experience is that she feels the Spirit moving in this archdiocese. This would never have happened on poor human energy. she’s heard from a parish that 49 new parishioners have joined Why Catholic. Scot asked Janet to Why Catholic in context of the Cardinal’s vision for the Archdiocese. She mentioned Catholics Come Home, Arise, his pastoral letters, and Why Catholic are all part of a program of extending an invitation to rediscover the Catholic faith. It’s in pryer that God speaks to us in the silence. To pray in this way is an evangelizing outreach. As the Archdiocese continues to restructure the ways we hand on our faith, our parishes or pastoral collaboratives might become bigger, but small groups help us to become more connected and to realize ever more that the Church isn’t just those we go to Mass with on Sunday, but so spans the world. Fr. Chris said it breaks down barriers and allows people to understand they are part of One Body in Christ. Mary Ann said those interested in Why Catholic, go to BostonCatholic.org and click on the Why Catholic logo at the bottom of the page (or lick the link at the top of this page.) Their office’s phone number is also 617-779-3640. Scot also reminded everyone that tomorrow night The Light Is On For You, every church and chapel in the Archdiocese will be open from 6:30 to 8pm. More information can be found at http://www.thelightisonforyou.org. I am so thankful for the Arise Process and Now the Why Catholic? sessions. Both programs have been very helpful to all the members these past few years, and one of our members of the small faith sharing group will truly become Catholic during this Easter Vigil at St.Joseph-St.Lazarus Parish in East Boston, she will be confirmed and recieve first Holy Communion. I am so thankful that she was moved so much by the experiences shared and has truly accepted her calling to be a Catholic.